As a long-time season ticket holder to New England Patriots football games, I have witnessed first-hand the evolution of an organization from hapless laughingstock to what it is now, a first-class organization that has institutionalized excellence. The early years were miserable. Constant losing, unbearable traffic, the worst stadium in the NFL and disorderly fans who ultimately led the league to ban the team from Monday Night Football. The ineptitude was systemic, both on and off the field, the New England football team earned its disparaging nickname, “The Patsies”. In 1994, Robert Kraft purchased the team, and from day one, things began to improve. An emphasis on security made it safe to bring your family to a game. Redesigned logos and uniforms signaled a new start for the brand. Better coaches and better players improved the product on the field. A winning culture slowly emerged. I talk often about the need for empathy when developing a brand. Understanding the needs of the customer, and sympathizing with their concerns are critical to the development of a brand that connects deeply with its customers. In the case of the Patriots, empathy is at the heart of their success. 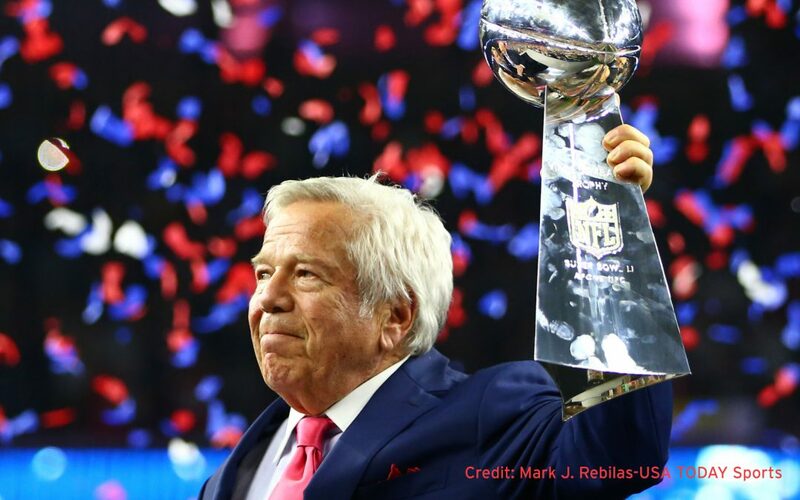 As a season-ticket holder since 1971, Robert Kraft was intimately familiar with what it was like to be a fan of the team, and to suffer as a result. His actions since purchasing the team demonstrate that deep understanding of his customers. With the arrival of the new millennium, off-the-field improvements to the fan experience mirrored what the world could see on the field. Plans were developed for a new stadium to open in 2002 and that was when ticket holders began to notice the change. Not only was Robert Kraft’s new stadium going to be privately funded (unlike many NFL teams who turn to local taxpayers), he went further by refusing to require ticket holders to purchase a Personal Seat License (PSL). A PSL, is a license that guarantees the rights to a particular seat in a stadium. Essentially, the customer pays a one-time fee of thousands of dollars for the privilege of purchasing a season ticket. PSLs had become a common, and unpopular money-making scheme used by wealthy NFL owners to fund their new stadiums. This gesture did not go unnoticed by ticket holders, many whom would have been unable to continue had the purchase of a PSL been required. As the Patriots won one championship after another, demand for tickets increased so much that the waiting list had swelled to over 50,000. With such a wildly popular product, it would have been easy for the organization to become complacent. Instead, it seems they had only just begun. Annual surveys were conducted to better understand fans’ concerns. As a result, each new season was greeted with more stadium improvements and a better fan experience. And each year the team introduced additional ticket holder benefits. It had become evident that within the organization, the question was being asked, “What more can we do for our ticket holders?”. Improvements inside and outside the stadium continued. They created the Patriots Hall of Fame and Patriot Place—a mecca of shopping, restaurants, and hotels. Inside the stadium, new clubs and concessions were added. The cynic in me couldn’t help notice that the majority of improvements for the fans happened to also be revenue-generators for the Krafts. But in recent years, that skepticism has faded as the team has continued to add features and benefits for the fans which add real value to the season ticket investment. One such example is the team’s Pass It On program that they instituted in 2010. Traditionally, a season ticket owner was unable to pass their tickets on to a family member without paying a hefty fee to the team. The Pass It On program removed that fee. Following the SuperBowl winning season of 2016-2017, the team took it to another level. Tickets, which had typically been mailed in a padded manilla envelope, this time arrived via courier in an impressive (and expensive) gift box. Opening the box revealed not only the season tickets, but also a 3’x5’ stitched Patriots banner which now hangs proudly on my flagpole on game days. In 2018, season tickets again arrived in a beautiful box, this time with a cast “sculpture” of Tom Brady. The team had done it again. But that wasn’t all. 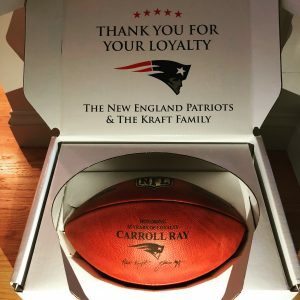 Several weeks later, a package arrived at the homes of fans who had been season ticket holders for 25 years or more, a number significant because it marked the anniversary of Robert Kraft’s purchase of the team. In a beautifully constructed box was a genuine NFL football stamped with the ticket holder’s name and the message “HONORING 25 YEARS OF LOYALTY”. Going above and beyond. And then going further. It could be argued that the generosity of the organization was nothing more than an attempt to purchase loyalty with gifts. However, what came next is what made the largest impact on me, and what prompted me to write this blog. I became aware of the football gift from a friend who has had his tickets for as long as I have had mine. I quickly realized that I would not be receiving this gift from the Patriots because my name had not been the primary name on the account for the entire time. The tickets were originally purchased along with my brother, however it was his name that was on the account at the time. When he stopped attending games some years later, we were able to transfer the tickets to my name by using the team’s Pass It On program. It was completely understandable why they would not recognize me as deserving of this gift, but felt I would write to the Patriots anyway to explain the situation. For several weeks I received no response and had pretty much forgotten about the issue. Then this email appeared in my inbox. When we kicked off the 2018 NFL season at home against the Houston Texans last weekend, we commenced the start of the Kraft family’s 25th season owning the New England Patriots. To celebrate this milestone and to express our sincere appreciation to our longstanding Season Ticket Members, we gifted a personalized, official NFL game ball to those who joined us in 1994, or earlier, and who have stayed loyally with us during the past quarter century. We have since realized that there were many long tenured accounts that had transferred their tickets in recent years to family members or close friends using our Pass It On program. Therefore, we are happy to communicate that we are going to utilize the date of the original ticket account for the purpose of recognizing this anniversary and other account tenure milestones. 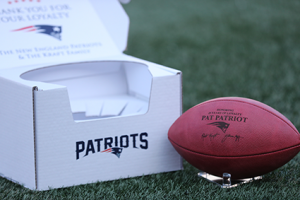 As a result, you will be receiving a personalized, official NFL game ball, honoring 25 years or more of loyalty to the New England Patriots. Your football will be shipped in October to your address on record. It is with sincere appreciation that we thank you for your longevity and continued support. Please accept this football as a small gesture of our unending gratitude. Brand Loyalty. The Holy Grail. With proper positioning, messaging and design, it’s possible to create recognition of your brand, and to distinguish your company from every other in its space. But brand loyalty can only be achieved by living up to the promises that your brand has made. Robert Kraft understands this. He had a vision, built an organization that believes in his mission and delivers on his brand promise every day. And for that, he has earned this customer for life.